In this three-part series, Craig Martin gives a practical how-to guide for creating travel podcasts. Part one outlined hardware and software needs. In this installment we look at how to use them to produce a polished audio file. It seems as simple as plugging in your microphone, hitting record and letting fly with your insight. That can be the case and, if you’re lucky, will work first time. But if you’re like most mortals the recording will sound flat or muddy, be filled with loud pops and snaps and have a soothing background hiss. Not the best. When everything you own is in a backpack you can’t afford to carry several kilos of pro-am studio equipment. However, you can still make your podcasts’ sound quality almost as good. Words like gain, reverb and echo don’t mean a lot unless you’re an audiophile. Fortunately, basic knowledge and good software go a long way in helping us use them. Let’s look at creating a “podcast voice” profile using Apple’s Garageband which aims to minimise hiss and avoid vocal flatness. After some fine-tuning this will ensure that all your recordings sound similar. Unfortunately it’s impossible to achieve true consistency when you’re changing location all the time. Open Garageband and create a new project. Get rid of the piano floating in the middle of the screen and create a new track by clicking “Track > New Track…” or using the keyboard shortcut ⌥⌘N. Choose “real instrument” and “vocals > no effects”; this gives us a clean palette to work from. Now it’s time to record something. Have a listen and play around with these settings until you have something you’re happy with. 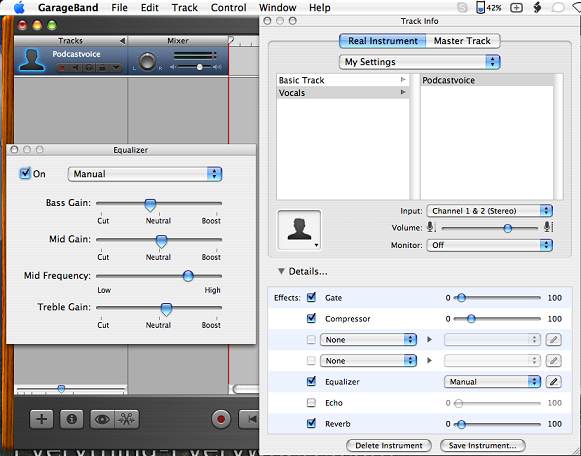 You can edit and save your new “instrument” at any time by double clicking the head-shaped icon. Still got hiss? As far as this software goes the only thing you can do is nudge the “gate” higher and higher: beware of raising it too high and cutting out your voice! Audacity provides an effective method for tackling intensive hiss which is well covered by Deepak Morris. I’ve used both of the above methods to minimise hiss over the last year, but the best way to deal with hiss is in the “studio” itself, even if it is a hostel laundry at three in the morning. 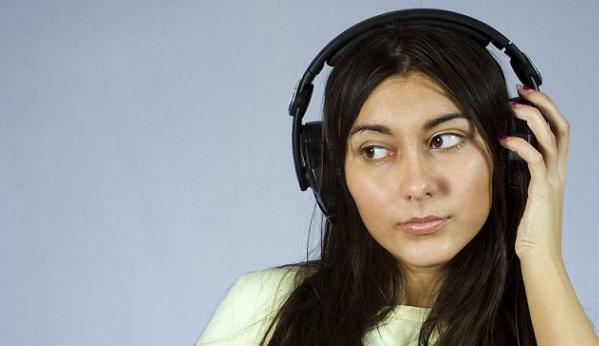 A room that sounds deathly quiet to us has background noise and (obviously) inbuilt microphones will pick up the sound and vibrations from a recorder. Sound deadening must be done with some kind of sound insulation foam, but I’ve also used a couple of books to good effect in creating a “cave” for my microphone. Your mileage may vary. Another shock in early recordings are the pops and splutters that appear in the recording. These are caused by “plosives” — sounds made by certain letters such as P and T.
In order to avoid plosive pops, professional broadcasters use a mesh-like filter between their lips and the microphone. I can’t imagine any traveller wanting to carry that! Experiments with a t-shirt have proven unsuccessful so far. Moving the microphone a little further from your mouth, however, can produce the desired effect without you resorting to talking to your clothing. It certainly doesn’t hurt to practise saying the target sounds without that sharp breath which comes with them. Now that the recording is done I have two more tricks to polish your recording to perfection. Export your sound file from the programme you’re working with as a .wav or a .aiff (.aiff and .aif are the same). Now drag and drop that file into the Levelator. This baby can work magic on an audio file, especially where there are different people speaking. It attempts to make the entire audio file the same level and is remarkably successful. After the programme’s finished you’ll have two files: podcast.aiff and podcast.aiff.output – listen to them both and choose your favourite, for me it’s normally the Levelated output file. 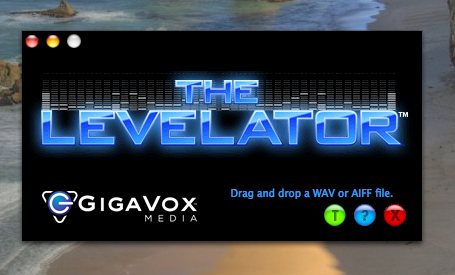 Mp3 is the industry standard, so convert your .wav or .aiff using iTunes> or lame. Now it’s time to adjust the volume of your track. 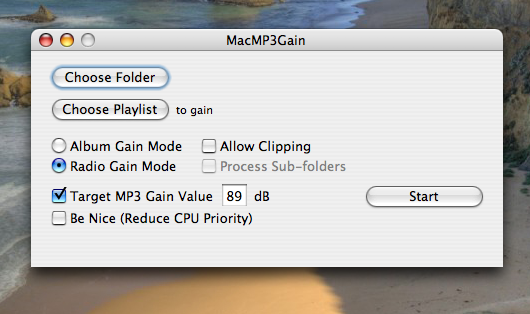 I prefer to use mp3Gain to do this (windows, mac). The programme allows me to set a standard volume for all of my audio files ensuring I don’t blow people’s ears out or people’s speakers up (sorry Chris!). The settings I use are shown in the following screenshot. Now your voice is ready to be broadcast around the world, but before we go there, let’s tidy up the packaging. I hate downloading audio files, chucking them into iTunes and losing them. To make sure your listeners don’t have the same problem it’s important to set the correct ID3 tag for each one. This can be done easily in iTunes, but other software options include Multi ID3 Tag Editor (Windows) and ID3 Editor (Mac). To change ID3 information in iTunes, locate the file and open the information panel by clicking File > Get Info or ⌘I. Click on the “Info” tab and enter as much information as is helpful. Work your way through the different tabs: many podcasters add show notes into the “Lyrics” field. It’s increasingly important to include an image as this is what shows when using iTunes’s Coverflow or list view, as well as on iPods and other mp3 players. This is part two of a three part series in travel podcasting. Part one talks about recording software and hardware options, whilst part three will cover content hints and tips plus a style guide for Matador podcasts. To hear some of Matador’s Podcasting talent, check out the Traveler’s Notebook podcast archive. Got something to add? Check out the submission guidelines, then get in touch.